One of the UK’s leading suppliers of workshop tools and equipment, with an annual turnover of over £51 million, The Sealey Group is renowned in the trade as a market leader, with a range that includes tools and equipment for the automotive, agricultural industries and engineering. Sealey distributes over 8,000 product lines and a further 130,000 spare parts to over 4,000 trading customers via a network of local, national and international dealers. The company has over 330 employees, including 20 external sales people. Mark Sweetman, Managing Director at Sealey, explained: “One of the areas vital to the continuation of our profitable growth was how to improve the way information was communicated to and from the sales team". 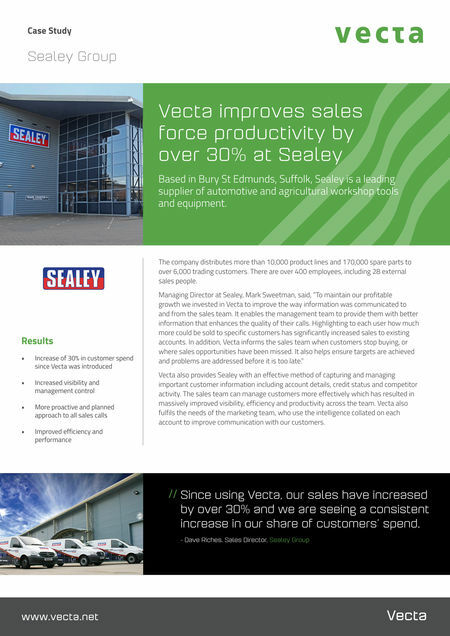 A powerful and easy-to-use sales analytics & CRM solution, Sealey selected Vecta to improve sales efficiencies and boost results, combat the competition, maintain margins and increase turnover. The Sealey management team are able to distribute better information to their mobile sales representatives which in turn enhances the quality of their calls. By highlighting to each sales person or user how much more could be sold to specific customers Sealey found that productivity increased for each call made.